The day after he turned ninety-eight my father asked me a question I did not want to answer. His birthday dinner the previous night had been quiet, unlike the surprise party for his ninetieth birthday. For that earlier event my children and I flew to Canberra. Members of the organising committee had met us at the airport and driven us to the restaurant where more than a hundred people were waiting. The Indonesian Ambassador paid tribute to my father’s achievements as a writer and teacher, and as a respected elder of the Indonesian community in Canberra. That time, an incident the next morning destroyed the happiness I had felt for my father. Now, eight years later, the mood was different. While my mother dozed on a couch nearby, my father and I talked quietly. I felt close to him. We reminisced about how our family had survived the Japanese occupation and the Revolution, how my mother had tricked the Dutch, and about our flight to the mountains. At first I could not speak. There were so many things I wanted to say but I knew they would hurt him. Bapak watched me, his eyes bright. Two trucks full of men with rifles drove into the street. We stopped playing hopscotch and watched as the soldiers jumped down. ‘Jepang,’ said one of my playmates. Japanese. My aunts stayed in the ceiling until the trucks had gone from our street. Neighbourhood children often came to the big yard in front of my grandparents’ house to play hopscotch in squares that we scratched in the dirt. Sometimes we would make mud biscuits or pretend gado-gado salad from flowers and leaves, and set up market stalls to sell them to one another. Then the fishmongers from the market came to buy the carp, and while they haggled with Aki I noticed my long gold chain necklace was lost – it must have happened as I was catching the fish. Knowing Mamih, my mother, would be angry, I ran crying to Nini, and one of the workers helped me comb through the mud. When we couldn’t find the necklace I grew terrified about what would happen when Mamih came home. Then Nini brought out the food: ikan goreng, fried fish, lalap, steamed vegetables and sambal, krupuk udang, prawn crackers, and nasi timbel. I loved nasi timbel and the way the rice smelt of the banana leaf it was wrapped in. I sat down beside the pond with my grandparents and the workers, and we had a big feast. It was fun being with all the grown-ups, laughing and eating, and I forgot to be scared that Mamih would be angry with me. And even better than playing games or helping Aki was being with my father. When I was little I called him Papih and he never got angry with me. Sometimes he took me for walks through the streets of our suburb, and one evening as we walked through the town square, my hand in his, I saw the soldiers again. They were sitting at tables outside a restaurant and had girls with thickly powdered faces, pink cheeks and bright red lips sitting on their laps. Everyone was laughing. I asked Papih about the soldiers and the girls, but he ignored my questions and made me walk faster. Another evening when we were walking we saw a man in hessian lying beside the road. It was a time when many people wore hessian sacking, but this man was covered in flies. ‘What’s wrong with the man, Papih?’ I asked. Again my father hurried past, pulling me along with him. I thought of the soldiers with their guns and shiny bayonets. Perhaps they had hurt the man in hessian. I hoped they would not hurt my Papih. Achdiat Karta Mihardja, my father, was born into a family of Sundanese nobles who lived in Pakuwon, a small exclusively aristocratic suburb in the city of Garut in West Java. Achdiat’s father, Kosasih Karta Mihardja, worked as a manager in a government-owned bank. While still at primary school Achdiat read all the books in his father’s huge collection, and developed a passion for literature and philosophy. His exam results made his family proud, but his ideas troubled them. At the age of twelve he decided that feudalism was divisive and, arguing that God created all people equal, stopped using his titles, shocking his parents, who valued their nobility. After finishing junior high school in Bandung, he attended the Dutch senior high school in Solo in Central Java, studying Asian literature for three years. He had actually been too old to be accepted into this school but, as birth certificates were not issued at that time, he was able to qualify by shifting his date of birth from 1910 to 1911. For the rest of his life his official year of birth was 1911. During his schooling in Solo Achdiat became active in the anti-colonial movement. Nationalist feeling had been boosted when the 1928 All Indonesian Youth Congress adopted the “Youth Pledge”, a resolution proclaiming the ideals of one motherland, one nation and one language. Subsequently all the provincial youth groups began uniting into one national group, Young Indonesia, and Achdiat helped found the Solo branch, becoming secretary. He rejected provincialism, and worked to rid himself of his Sundanese-ness. The first great love of Achdiat’s life was Arini, a fellow student at Solo. They planned marriage but Arini’s family forbade it because of the ethnic difference – Arini was Javanese. The two young lovers were heartbroken. Achdiat continued to question traditional ways of thinking, especially after another incident when his father ordered Achdiat to accompany him to an audience with the Bupati, the head of Garut Regency, the local government. The Bupati was a high status Sundanese man, the official through whom the Dutch administered the Regency. Achdiat’s father followed the tradition of paying obeisance to the Bupati at certain times. When Achdiat saw what he must do – crawl on his hands and knees to a position before the Bupati, keeping his eyes always on the floor even while raising his clasped hands in the gesture of respect, addressing the Bupati as his lord – he refused. His father was enraged at the embarrassment Achdiat caused him. A rift opened between father and son with the devout Kosasih angered by the way Achdiat questioned everything, even his religious beliefs. Their arguments began to cause tension in the family. After high school Achdiat wanted to study philosophy and literature at university, but his father could not afford the fees, so Achdiat became a teacher at Taman Siswa, a nationalist private school, and joined the editorial staff of a newspaper and a journal. Then Kosasih lost his job due to the depression and received a lump-sum payment with which he bought an auction shop for Achdiat who tried to interest himself in the business so that he could earn enough to attend university. Near the shop was Restaurant Bandung where Achdiat began to have lunch every day because he had noticed the beautiful and self-assured young woman who worked in the kitchen. The scholar M A W Brouwer said that God was smiling when He created Parahyangan, the heartland of Sundanese West Java, a realm of active volcanoes, lush forest, vegetable gardens, terraced rice fields, citrus orchards and serene tea plantations. Haji Noor and his wife owned some of those fields, as well as businesses in Garut such as a large hotel with a popular café and billiard room. Their first child, born in 1917, was Suprati, my mother. Tati, as she was known, was nine when her mother died from tuberculosis. She took over responsibility for the household, looking after her father and four siblings. Haji Noor passed on his management expertise to Tati, and she became confident and quick-thinking. When she was twenty, he arranged for her to learn the art of restaurant cookery and, while working at Restaurant Bandung, Tati Suprati Noor met Achdiat Karta Mihardja. The couple began courting. Achdiat introduced Tati to his family, and she and Achdiat’s sister Ipit became close friends. Ipit sometimes accompanied the couple to the cinema as chaperone. But when they planned marriage, both Achdiat’s and Tati’s parents refused permission because tradition dictated that nobles and commoners must marry within their own class. The aristocrats believed that their blood would be diluted by mixed marriage, while Haji Noor was more concerned about the dilution of his wealth. Achdiat’s experience at school in Solo had hardened his resolve – having lost Arini through ethnic prejudice, he would not allow class prejudice to separate him from Tati. The couple threatened to elope and, although such a catastrophe would ruin each family’s good name, their parents still resisted. Then Tati left home and went to stay with her aunt in Bandung and this, the first step towards elopement, forced both sets of parents to consent to the marriage. The wedding took place in June 1938. Achdiat and Tati were pioneers, among the first Sundanese to marry outside their social class. Others followed their example until gradually such unions became common. I was born in April 1939. Haji Noor asked that his first grandchild be named after the rice goddess Sri Anggrawati in the hope that I would develop her refined and feminine qualities. He could not have anticipated how events in the coming years would frustrate this wish. My father added “Wennie” to my name as he liked its sound, despite its Dutch flavour. Achdiat and Tati struggled to survive in the first years of their marriage. The auction shop failed, and they moved to Bandung, where they converted half their tiny house into a warung, a small shop selling basic necessities. Achdiat wrote short stories and articles for news services, and had a growing reputation as a journalist and writer. 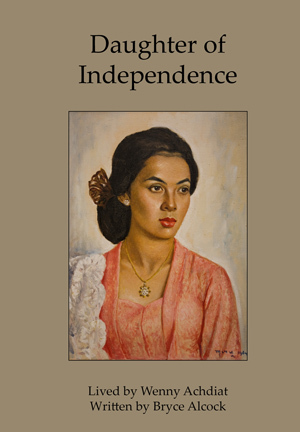 In 1941 we moved to Jakarta, where Papih became an editor at Balai Pustaka, the publishing house set up by the colonial government to provide appropriate reading matter for the “natives”. A year later Achdiat was diagnosed with the first stage of tuberculosis, the disease which had killed Tati’s mother. He needed cooler mountain air so we moved back to Garut and stayed with Achdiat’s family in Pakuwon. In March 1942, Japanese forces occupied Java, and my earliest memory is the coming of the soldiers to our street. My sister Ati Asyawati was born at this time, and in choosing her name, Achdiat was influenced by larger events. He had observed the rapid succession of Japanese victories, and believed that the age of European imperialism was ending, that Asia’s time had come, so he included ‘Asia’ in Ati’s name, changing it to ‘Asya’ so that it would not be too obvious in case of a resurgence of Dutch power. Achdiat’s health quickly improved and a few months after the Japanese invasion we moved back to Jakarta and rented a house in the suburb of Menteng. Papih joined the staff of the News and Information Service of Radio Jakarta, and one of his duties was to translate Indonesian into Sundanese for listeners in West Java. Later I found out that at the same time as he was working for the Japanese administration, he had also joined the anti-Japanese underground movement and was involved in black market operations. I rode pillion on my father’s bicycle while Ati sat on Mamih’s bike. Ati and I wore our going-out-on-Sunday clothes – frilly dresses instead of our usual playsuits. My sister was nodding off. I was four years old when the best thing in the world was riding pillion behind my Papih, listening to his funny stories, stopping at roadside stalls for saté, or calling on friends where I would play with the children. And the really best thing, I thought, was Papih’s special name for me – “Nyenyen”. Mamih only ever called me “Wennie” but I knew my father had made up another name to show his extra love for me. I laughed and wrapped my arms around him, and he let me stand on his feet as he waltzed around the room. But better than anything else in the world was when Papih took me for a walk, late in the afternoon when the house was hot, just the two of us with my hand in his as we explored the streets of Menteng. Once, when we passed a footpath vendor, I wanted fried peanuts and asked Papih to buy me some. But he never carried money – that was Mamih’s job. Then I remembered that I had money and I pulled from my pocket a note of the smallest denomination. I ripped the note in half. ‘This is two,’ I said.